Mike Brown, the 18-year-old unarmed teen shot and killed by a police officer in Ferguson, Missouri, last weekend, may have been involved in a "strong-arm robbery" shortly before the shooting, Ferguson Police Chief Thomas Jackson said at a press conference Friday. 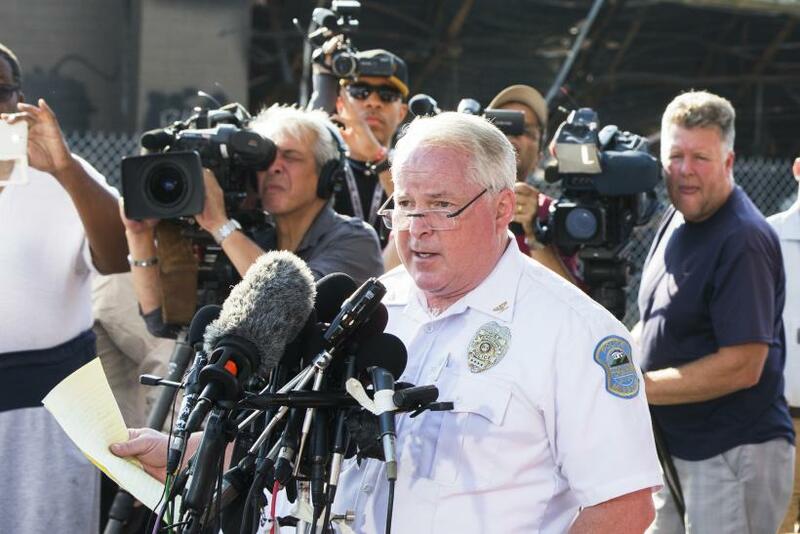 During the long-awaited conference, Jackson also identified Darren Wilson as the officer who fatally shot Mike Brown. The theft occurred Aug. 9 at a convenience store near the location where Brown was killed. It happened between 11:53 and 11:54 a.m., says a police report released by Ferguson police. Brown was named as a suspect in the report that details an altercation that happened between the teen and a store worker. Surveillance photos from the convenience store were also released by police. Along with Brown, shooting witness Dorian Johnson is also identified as being in the store during the robbery. The pair were suspected of stealing Swisher Sweets cigars from the store. Johnson has recently given several interviews on the shooting, which occurred around 12:01 p.m. as Wilson traveled to respond to a 911 call reporting the robbery. Johnson, who was walking alongside Brown, says the officer initially ordered them to get out of the street. He also says that Brown never attempted to reach for the officer's gun and was surrendering with his hands in the air when the officer fired. "[Brown’s] hands immediately went into the air and he turned around to the officer. My friend started to tell the officer that he was unarmed and that he could stop shooting. Before he could get his second sentence out, the officer fired several more shots into his head and chest area. He fell dramatically into the fatal position. I did not hear once he yell 'freeze,' 'stop' or 'halt.' It was just horrible to watch." Wilson said in the report that he received a description of the reported robber as he traveled to the call. On the way, he came across Brown and Johnson as they walked to Brown’s grandmother’s home. Wilson has been placed on administrative leave as the investigation into the incident continues.